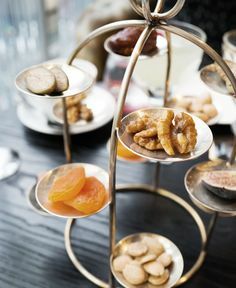 If you have yet to become a tea connoisseur, it’s very likely you are picturing a hot cup of tea with added milk when you read the title of this article. 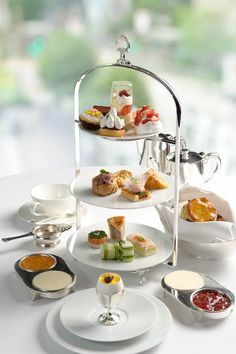 Contrary to the seemingly ambiguous nature of its name, Cream Tea is actually a light afternoon tea meal or dish – originating from the South Western Counties of Devon and Cornwall in the United Kingdom – and it is comprised of scones, served with cream and jam, and accompanied, by hot, black tea. 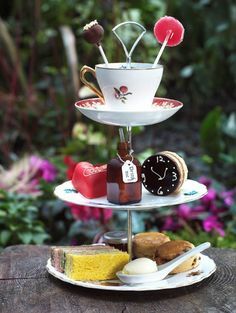 It is said that to best enjoy the sweet, delicious flavors of the dish, one must “learn” to drink tea without sugar, as the sweetness comes from the jam and cream. You may also hear it referred to as Devonshire Tea. 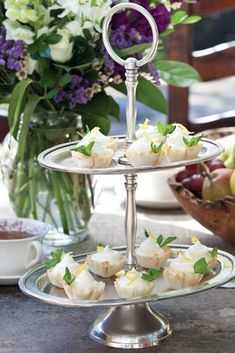 Traditionally, the cream is “clotted cream”, although whipped cream generally takes the place of this delicious luxury as clotted cream is quite a specialty, and some even just prefer butter to the cream. Clotted cream is not whipped cream, but cooked. It is made by indirectly heating unpasteurized cow’s milk which then is left in a shallow pan for many hours which causes the cream to rise to the surface and ‘clot’ – it is truly delicious, laden with fat, and an indulgence! Cows in the West Country (of the United Kingdom) are highly famed for their production of superb cream. Hence the origins from this region of the world. From Cornwall this is Clotted Cream, from Devon, this clotted cream is Double Cream. Fortunately, it’s possible to purchase this treat online! Cream Tea has an ironic history, particularly about the disagreements of whether the jam or cream goes on top! While it may seem silly to some, some Cream Tea lovers are fighting over protections for the name “Devonshire Cream Tea,” as they insist the only proper way to eat the dish is with the gourmet jam on top of the delicious cream. However, those in Cornwall are standing strong for their cream-on-top preferences, insisting jam should never be on top. Though its origins remain highly disputed, a general consensus exists that since the jam was the most expensive, the cream was generously placed on first, topped with a bit of jam. This leads us to believe that its true origins are likely from Devon. We’re sure, however, that no matter which side of the rivalry you fall, you’ll enjoy good Cream Tea just the same. Whether jam comes first then cream, or cream comes first then jam (or indeed, whether the two are a bit mixed…), scones with jam and cream are delicious with a hot cup of black tea. An afternoon with scones, jam and cream, great friends, good conversation, savory tea and perhaps even a debate over the order of application of cream and strawberry jam – What is there not to love? 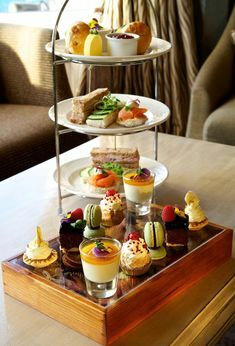 A Cream Tea afternoon is bound to be a conversation piece in itself, and we have some hints to make it all the more delightful! Check out the fun (and easy) tips below. When preparing for a Cream Tea gathering, you can begin with a batch of your favorite locally baked scones, or use your favorite scone recipe (never with sultanas, currants or any other inclusion). You’ll want to purchase clotted cream. Local strawberry preserves or jam are a necessity, and if you are serving to a group, be sure to have spreadable butter on hand. For more “stability,” create the Cream Tea dish as those in Cornwall do. In Cornwall, they place the cream on top of the preserves, which keeps the preserves from sliding off of the scone. To create a conversation starter, create half of the scones in the Devon style, and half in the Cornwall style. For a beautiful, presentable plate of Cream Teas, try alternating rows of Devon and Cornwall style. The colors and variety will create an artful masterpiece on your fine china! You may want to leave a few “blank” scones for those who prefer butter over cream. It’s quite an offense to combine the two! To prepare the Cream Teas, split the scone in half horizontally and add half an inch of clotted cream to each side. Then, top them with a teaspoon of jam on each half. Purchase small dishes such as these from Amazon to serve your guests jam and cream on individual plates. Be sure to have a piping hot pot of black tea to serve. An excellent choice is an English Breakfast Tea or an Assam Black Tea. 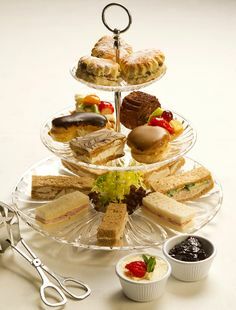 The English generally prefer their Cream Teas at “tea time,” which is around 4 or 5 in the afternoon. Tea time is thought to originate from the time a hardworking family would come in from working on the farm. The working family would be hungry and ready for tea, but cooking four meals a day was much too time consuming for the farmers’ wives. However, Cream Teas were a quick solution for quick calories and a cup of healthy tea. To stay true to English tradition, you’ll want to make sure you’ve prepared the Black Tea flawlessly. To get it just right, with no bitterness, and to minimize the taste of tea bags (if used), follow the flawless steps below. Warm water in a kettle, and just before boiling, pour the water into the teapot. Carefully move the teapot to coat the inside with warm water and then empty the teapot. Add loose tea or tea bags to the teapot. Once the kettle is boiling, add water into the warm teapot, pouring over the tea. After the tea steeps for three to four minutes, stir and pour into tea cups. With the tips above, you’re sure to enjoy the perfect Cream Tea, whether you are at home or in West Country England.